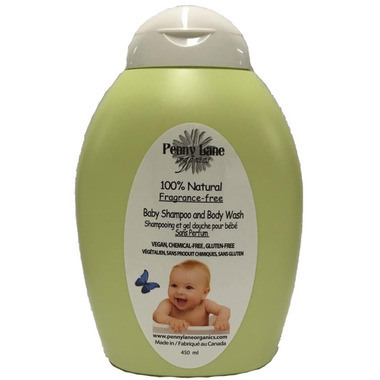 Featured as "BEST FOR BABY" by EcoParent Magazine, Penny Lane Organic Baby Shampoo and Body Wash is a mild, non drying shampoo that can be used daily. Just squeeze a few drops of shampoo on a wet wash cloth, leather and gently massage your baby's hair and body staying away from the eyes. Rinse and dry. Vitamin E in our products is made of NON-GMO Soy bean oil and therefore gluten free. Excellent product. Lathers nicely and Iâ€™m glad to use it knowing Iâ€™m not putting a bunch of needless chemicals on my kids skin. Happily used this product for 4 years. A little goes a long way! This is the only product my son has used since birth. He has very sensitive skin and this has not given him any issues! Highly recommend this! I have been using this product since day one with my son. He is 6 months and hasn't had any skin issues. I also like that it doesn't have a chemical perfume smell like a lot of baby wash.
Love this for my daughter's sensitive /eczema prone skin. Super gentle. Love this product! Leaves baby smelling clean and fresh (that wonderful natural baby smell!) without any added chemicals or scents. Gentle and a little goes a long long way! Very gentle shampoo. Highly recommended. This product is great. It doesn't irritate my baby and is so gentle on her. I love all the Penny Lane baby products as they are natural and safe to use on my baby !